Had this with Christmas lunch 2007, and although it was quite nice, it didn’t really merit the effort to get this label off! 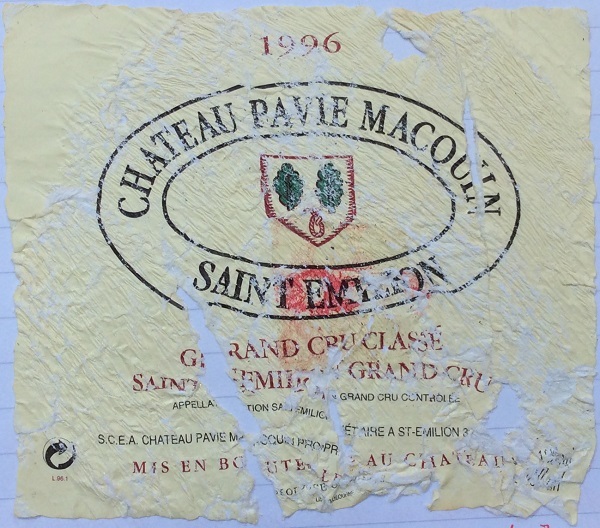 Pavie-Macquin was promoted in the 2006 St Emilion classification revision, to Premier Grand Cru Classé B, but I guess this was before their quality change. Quite deep garnet core – reflecting the Merlot content – with a narrow brick rim. Moderate intensity nose of blackcurrant, toast? and pencil lead. Mature, slatey / minerally savouriness on the palate. Still robustly structured, but needs more fruit to survive 5+ years. Not bad, but could do better.